Marsha Lynn (Millard) Atchley was born August 20, 1958 in Independence, Missouri and departed this life on March 16, 2019 at her daughter’s home in Raymore, Missouri, surrounded by the love of her family, at the age of 60 years, 6 months, and 24 days. She was the daughter of Albert Shumway and Delcie Bernice (Enloe) Millard. Marsha attended Hickman Mills High School. She went on to obtain an Associate of Arts Degree from Longview College. She had been employed as an accounting clerk for several years before health issues forced her retirement. On March 22, 1975, Marsha was united in marriage with Eric Craig Atchley in Kansas City, Missouri. They lived several places early in their marriage including Kansas City, Grandview and Belton. In 1989 they moved to Lake Annette, Missouri to make their home. 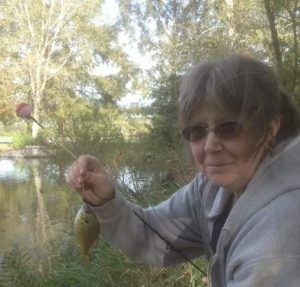 Marsha enjoyed painting with water colors, writing poetry (and was a published author), and fishing. What brought the most joy to Marsha’s life however, was her family. She was a loving and devoted wife, mother and grandmother. Marsha dearly loved to “hang out” with her grandchildren, giving loving encouragement in their life’s endeavors and taking pride in their accomplishments. Marsha was preceded in death by her parents, Albert S. and Delcie Bernice Millard and one brother, Dennis Millard. She is survived by her husband, Eric Craig Atchley of the home; one son, Eric Craig Atchley, Jr. and wife Erica of Raytown, Missouri; one daughter, Jessica Lynn Guzik and husband Mark of Raymore, Missouri; two brothers, Lewis Millard and wife Eva of Lake of the Ozarks, Missouri, and Wayne Millard of Tucson, Arizona; cousins, Julie Clark and husband Randy, and Cheryl Pettet and husband Brad all of Independence, Missouri; nine grandchildren, one great grandchild, other relatives and many friends. Cremation has been accorded. A Memorial Service in loving memory of Marsha Lynn Atchley will be scheduled at a later date. The family of Marsha L. Atchley suggests contributions, in her memory, to the World Wildlife Fund. My sincere condolences for your loss may the God of comfort be with your family during this most difficult time. Please find comfort from these words 2Corinthians 11:3, 4 and Isaiah 25:8. I have too many special memories of Marsha .she was a wonderful person and a good Confidant someone I could talk to . She’d been in my life for 34 years and I missed it the last few however my Fondest Memories of Marsha are her baking. She always brought homemade baked goods to all functions and she made her kids birthday cakes from scratch. And they were not just a sheet cake or round cake decorated she made all kinds Strawberry Shortcake and I believe one for Star Wars for Eric Jr don’t quote me on that though. She taught me many wonderful things when it came to baking and I thank her for that. I have very fond memories of Marsha always will that’s my gift from her. Sending prayers to Marsha’s Family. She was very loved in the pulmonary rehab program! She was a very fun and loving person. She will be greatly missed.